Or, so says a recent study by two professors at UGA. 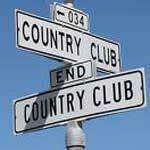 The street or neighborhood name “Country Club” increases the value of a home by 9.3%. So, how much value do you add for Psycho Path or Divorce Court? I am sure the figure- “9.3%” is debatable. However, I would agree that people pay a premium to live in certain neighborhoods or streets. And what are 3 most important words in real estate? Location, location, location. Read the full article about the value of a street name.